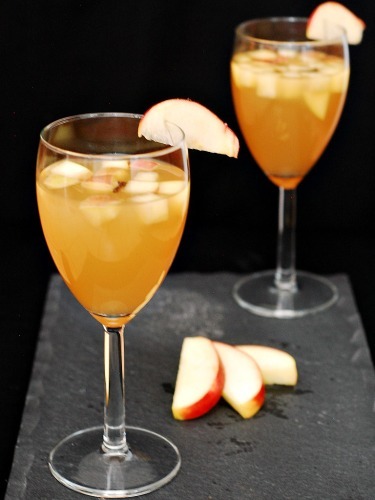 This apple sangria is flavored with sweet honeycrisp apples, warm spices and brandy. It’s light, refreshing and my new favorite drink! Apples. What else says “autumn” like apples? Okay, pumpkin. And changing leaves. And … never mind. I never considered myself a fan of apples. The only apples I ate out of hand were Granny Smith. And I wouldn’t eat apples any other way. Not a fan of apple pie. Or apple cobbler. Then I had a honeycrisp. What is it about honeycrisps that make them so delicious? Where have they been all my life? Okay, they weren’t released until I was 11 years old, but where were they from then until my first taste at age 29?? 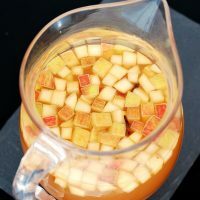 When combined with fruity white wine, cinnamon, cloves, brandy and apple cider, you get a light, refreshing, essentially autumnal beverage of the adult variety. I used to think that sangria was a summer beverage, but I’m so glad I discovered this apple version. 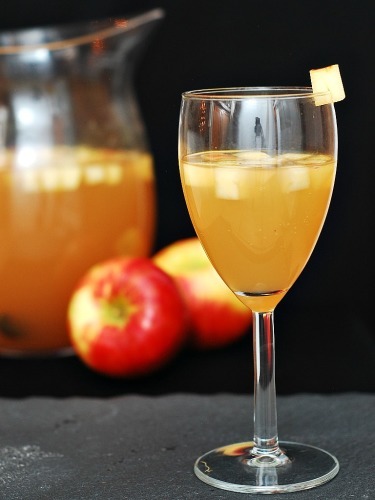 Combine the wine, cider and brandy in a large pitcher, stir to combine. 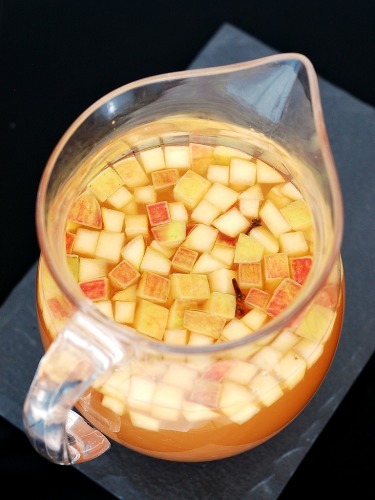 Add the apple cubes, cinnamon stick and cloves. Discard the cloves and cinnamon stick before serving. This looks gorgeous, I think Honeycrisp apples are the best! So pretty. And now I’m thirsty. I am the same way – I’m not a huge apple person but honeycrisps are my fave. Great sangria!! Delish. So seasonal yet brings out the summer even if in a make belief way through this sangria! I love that you made this with my favorite apples! Honey crisp are the best! Honey crisps are my favorite kind of apple! Ooo! I adore honeycrisps!! This Sangria looks fantastic! I love all apples, but Honeycrisp is definitely high on that list! This Sangria sounds amazing – I want a pitcher. Honeycrisp is my favorite apple, too! I love that tart, sweet, crisp taste and I can just imagine how wonderful they would be in this sangria! I could go for a pitcher of this right now… yes a whole pitcher just for me! Oh heck yes, this sounds amazing. Honeycrisps are definitely a favorite apple of mine. This sangria sounds great! Perfect for the season. Festive and relatively light. I like it!